I am amazed at the women on this list; I know so many of them. Hard-working, incredibly smart women who have overcome obstacles, grown businesses, mentored others and worked to change their clients’ worlds and our industry. I love that the list is from every hemisphere (debits are still on the left even in New Zealand & Australia!). We truly belong to a global community. 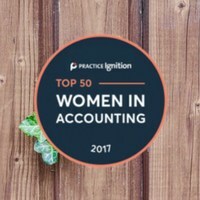 I also love that there are CPA’s/CA’s, bookkeepers, partners, business owners and team members on the list because as women we can lead no matter our role. As I continue to grow my business, seeking ways to serve my clients and my colleagues, I hope for the opportunity to meet every woman in this group. I want to hear their stories, learn from them, and help them magnify their voices. In the meantime, I will cheer for all these ladies and watch as they continue to succeed, lead, and thrive! How have you worked to help the accounting industry and the people who are in it for the better? My passion is to help accountants see that they are not just in need of tools of the trade, but they are business owners who need to develop their leadership methods and mindset. That’s why I am a member of the Intuit Trainer Writer Network, and have previously been a speaker on the Intuit Firm of the Future roadshow. I don’t want accounting firms to just get by. I want them to thrive as they make a real difference in the lives of their clients. How do you help the accounting industry? Individually, I coach firm owners who are “stuck.” I help them discover opportunities in order to capitalize on their experience and intelligence! I love seeing accounting professionals get excited about their work again. That usually happens when they transition from hourly billing to value or fixed pricing. This model helps the accounting professional live the truth that she is worth so much more to her clients than how many hours she works. What are some of the biggest highlights of your career so far? I have been a Senior Trainer at Sage, Director of Education at Xero, and a speaker for Intuit and at Scaling New Heights. I am currently a member of the Intuit Global Trainer Writer Network and owner of my own business. At least that’s how my resume reads. The real highlights are having the opportunity to encourage an accounting professional to take a risk on themselves and seeing it pay off. Every time one of my consulting clients lands a client they didn’t think they could get or implements a fixed price model to be more profitable and provide more value to their client: those are the real wins for me! In your opinion, what is the current biggest challenge/barrier the accounting industry needs to overcome and why? Transitioning from one generation of leadership to another is the biggest issue that needs to be addressed especially in the United States. Offering flexibility in the work environment, type of work, and even firm structure is key to success with the next generation of accounting leaders. Mentoring and coaching relationships can help the members of the firm from every generation succeed as a cohesive team which has staying power through a succession plan. I am deeply grateful for the honor of this award! 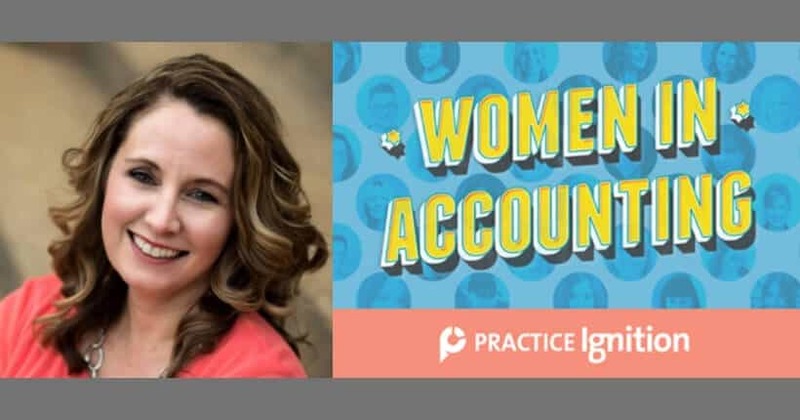 To read my full interview and to see the profiles of the other amazing award winners, please see the Top 50 Women in Accounting by Practice Ignition. If you are an accounting professional, you can strategically lead your accounting firm to become a modern practice. Start by scheduling an appointment with me.